ESPN is jumping into the scripted web series world on October 2nd as it debuts Mayne Street, starring the irreverent silver-haired ESPN anchor Kenny Mayne. Mayne plays essentially a version of himself – offbeat, dry, tongue-in-cheek – a sports reporter trying to make the most of his frequent blunders. Created by Josh Shelov (writer of soccer-flick Hooligans) and Todd Pellegrino (ESPN producer), the 15-episode series was definitely not done on the cheap. Word is that the budget was in the high six figures. Shelov and Pellegrino are both former ESPN production assistants who know the Bristol office antics well. The cast is formidable, Mayne’s producer is played by Alison Becker (former host of AV Squad), while web veteran Ben Schwartz (creator of SuperDeluxe’s Webby-nominated Bronx World Travelers) is the hotshot young new ESPN suit. Aubrey Plaza plays his assistant. This being ESPN, cameos will be the name of the game. In-house names such as Scott Van Pelt, Linda Cohn and Neil Everett are said to be featured at some point, along with most of the cast from HBO’s The Sopranos. The series is in some ways an extension of the successful ad campaign, “This Is SportsCenter,” that ESPN began way back in 1995. The short ads were almost a series themselves, showing some (fictional) comical moments from SportCenter staff on the Bristol campus as they interact with a gambit of athletes, celebrities and even mascots. 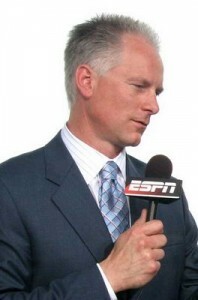 Kenny Mayne was one of the best in these spots, often taking the dry character to outright absurdity. Here’s a recent clip that should give us a hint at what to expect when Kenny Mayne, the actor, takes the digital stage in a little over a month.